1. Come any time the park is open (which is just about any time except at night) and you will find our garden unlocked and ready to explore. Directions are at the above link and at the Montgomery County MG contact page. (We’re at the top of the hill behind the Extension building.) Please leave everything as you found it – keep the gate closed against deer, and don’t pick things (okay, you can have a cherry tomato when they’re ready. Don’t tell anyone I said that). 2. If you are able to, come on Thursday mornings, when the demo garden team is there working. We’ll be happy to show you around. 3. We just had our first garden tour of the season and we want to have many more. If you have a group that would like to schedule a tour, with plenty of time for questions and exploration, call the MG office at 301-590-2836. Or comment on this post with your email address. Here are some photos of what’s going on in the garden right now. Barbara planted her sweet potatoes! 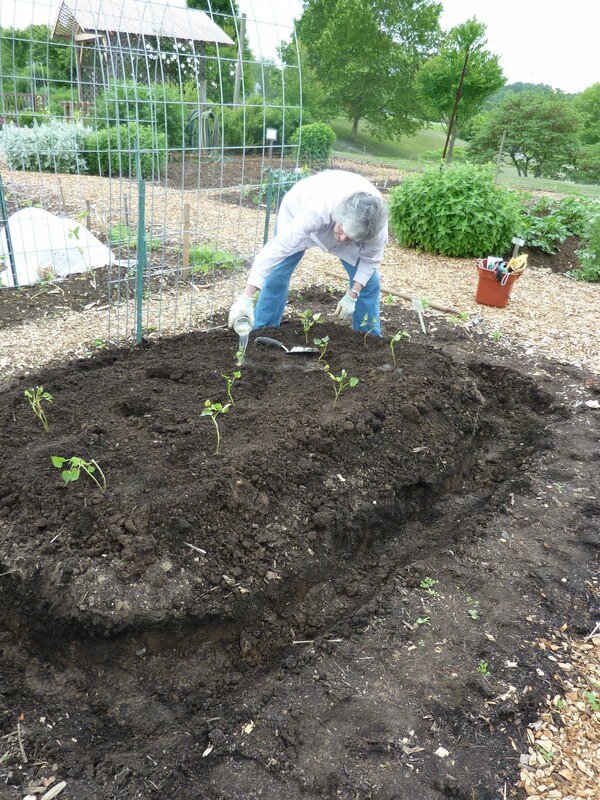 We’ll add a hardware cloth fence in the oval trench, to keep the voles out. 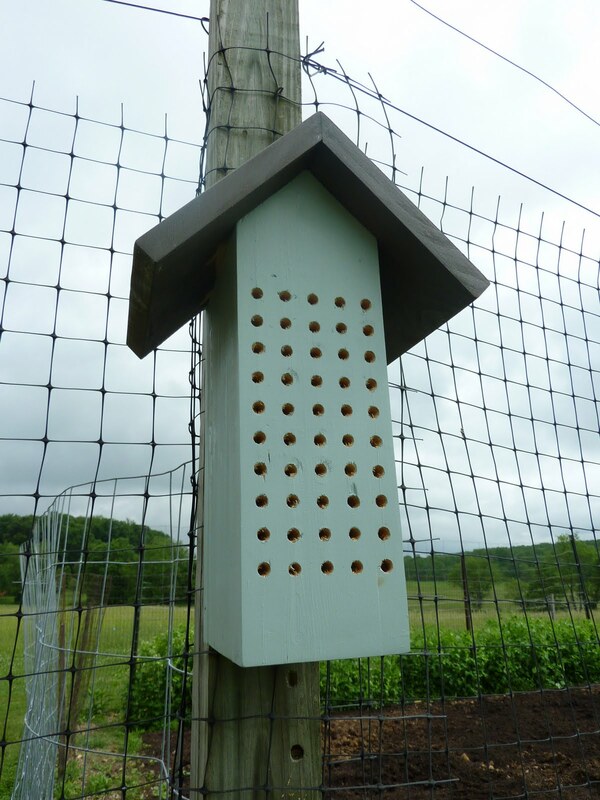 And we have a new mason bee house, thanks to Margaret. 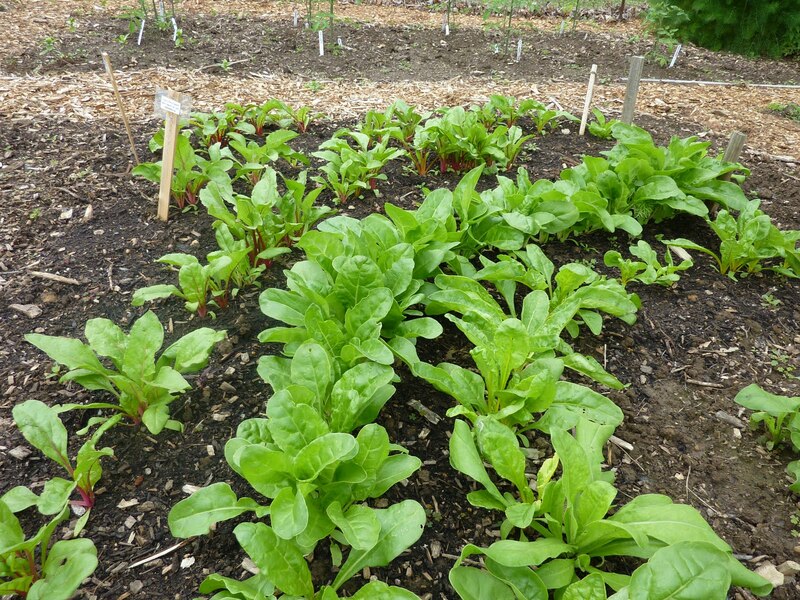 We start harvesting in earnest this week, and some of our produce will go to Manna Food Center. 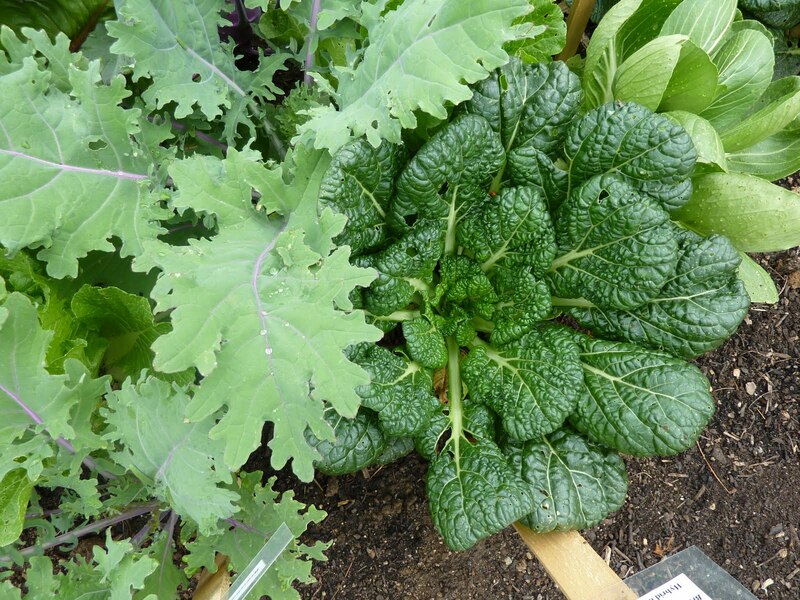 Here’s a lovely group of kale, misome and pak choi ready for dinner. 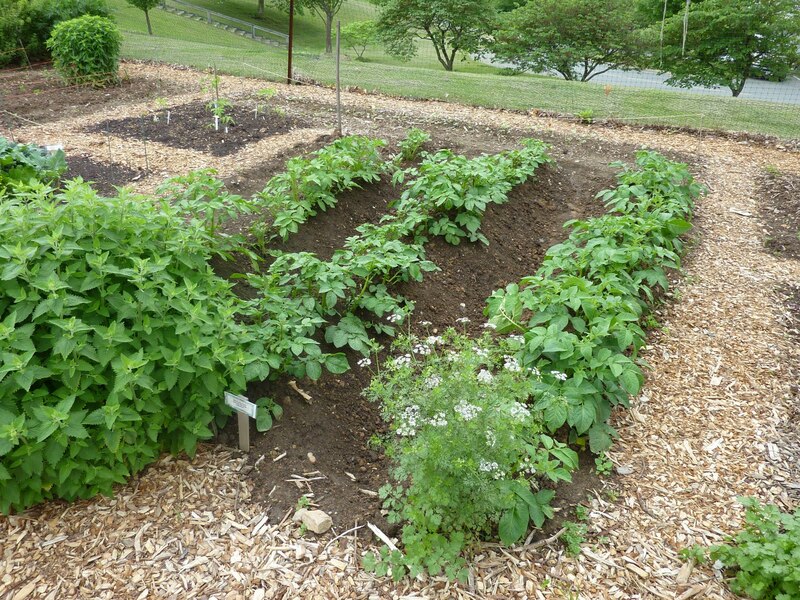 Also, remember the potato bed I showed you last month? This is how it looks now. The trenches are now between the potato rows, since all that soil has been used to hill them up as they grow like crazy. We’re watching carefully for signs of potato beetles and other pests, but all we saw today were lots of ladybugs. Good! Come down the garden path and see us! We look forward to meeting you. ← Now the real fun begins! 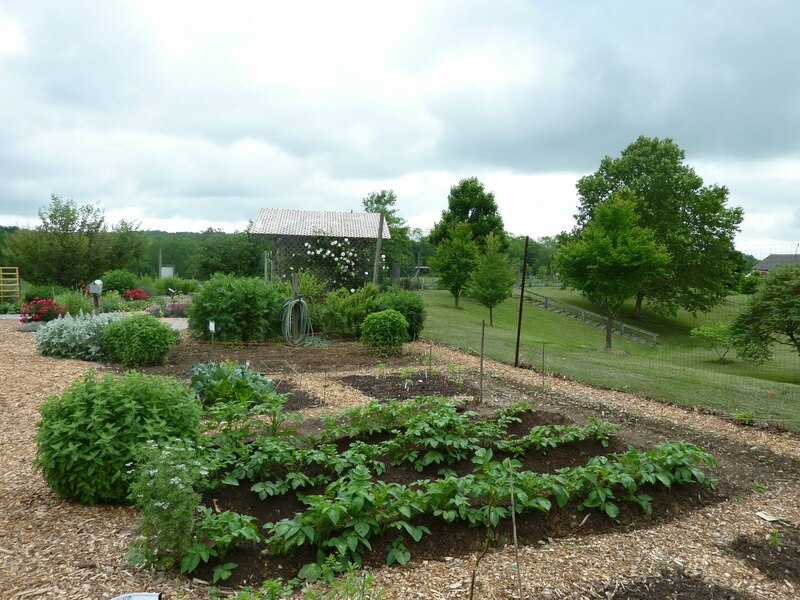 What a grand demonstration garden and photos. Believe it or not, a Colombia Gardener at their annual meeting asked me how to keep voles from eating her sweet potatoes, and I suggested a hardware “cage” or “fence,” but I could give no specifics. How will you install yours–below and above ground? I'll pass your good word on! 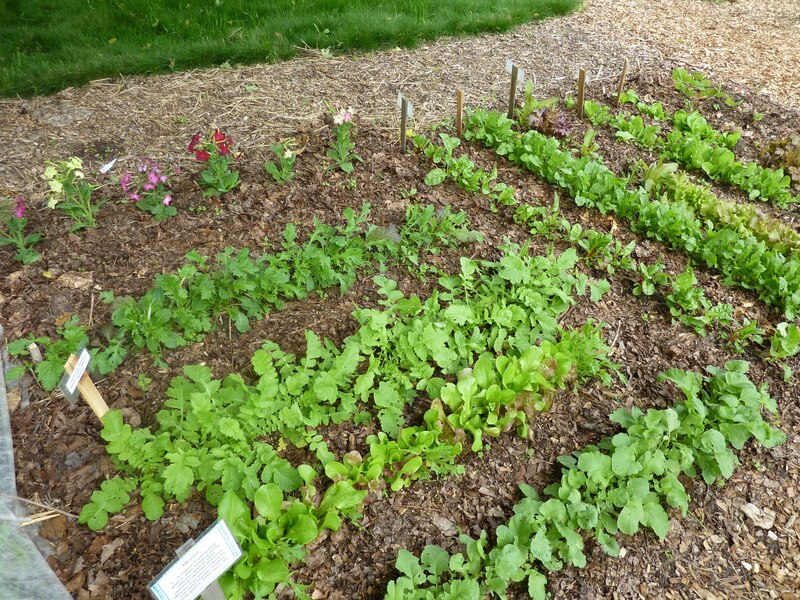 Wow, you gardeners are really meticulous out there! 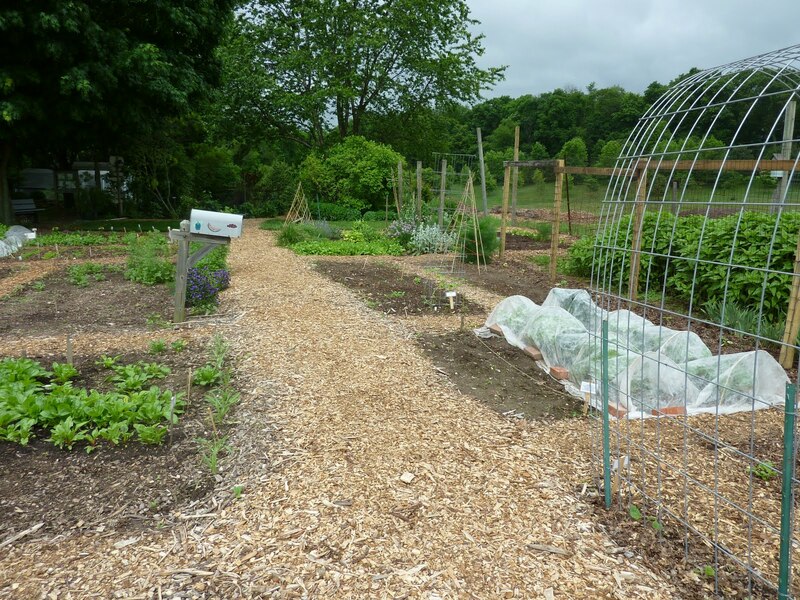 I have totally forgotten about this demo garden in Derwood, but have always wanted to visit. I'm going to write it on my calendar to come and visit you all on Thursday just after school(and work) lets out! Wendy, it would be wonderful to see you! Bob, I'll post photos of the cage when it's up, but basically the hardware cloth is shaped into an oval (because that's easiest; could be another shape) and set into a trench dug about six inches below outside soil level. Inside, the soil is piled up about 8 inches or more before the plants are set in. The fence is 2 feet high altogether so extends 1 1/2 feet above ground and 6-10 inches above the planting level. It does a great job keeping out the voles and other critters. Sometimes the plants do grow through it underground and those sweet potatoes get chewed on. Hey, Liz – looking forward to seeing you there!